Have you ever wondered if you could grow a garden indoors? Yes, it’s absolutely possible. You don’t have to churn out excuses anymore for not having a proper garden at home. You might not have the required space and time for setting up a perfect garden in your backyard, but don’t let that be an excuse for not having a garden. You can simply set up hanging flower baskets around and inside your house. 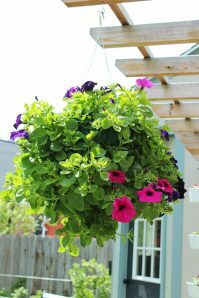 The idea of hanging a flower basket might sound simple, but it’s not as easy to grow and maintain them like regular garden plants. You hang them off rooftops, rafters, and arches. They are usually elevated off the ground, and weigh lesser than normal potted plants. You need to take good care of them since they tend to dry out faster than normal flowering plants. 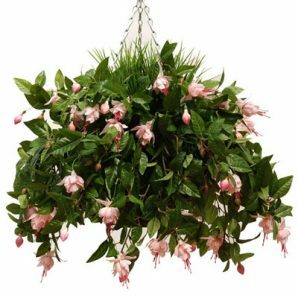 1 Why choose hanging flower baskets? 6 Where can you get one? 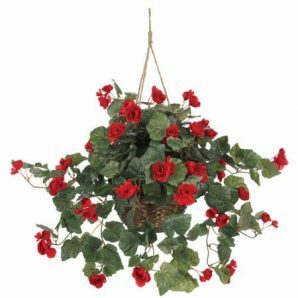 Why choose hanging flower baskets? Many of you might like gardening and taking care of plants. But your busy lifestyle and hefty work load might keep you away from getting your hands soiled. If you live in an apartment or within enclosed premises, there wouldn’t be enough space and concrete-free soil for you to plant some greens. Don’t let any of these be a reason for giving up on your gardening dreams. This is where hanging flower baskets come to your rescue. 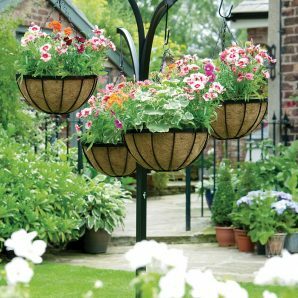 You don’t have to worry about time or space when it comes to setting up hanging flower baskets. They are also easier to care for once you get a feel for them. 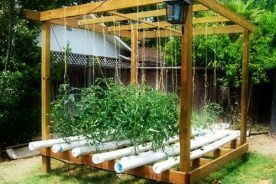 They can be set up in such a way that they retain water for a longer time when compared to normal potted plants. Unlike flower beds in the garden, these hanging baskets don’t need excess watering or pruning; taking care of them is going to be a fun-filled activity. They can also be designed in any size, and you can hang them around the house effortlessly. 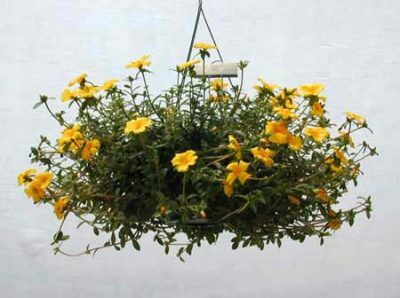 You can simply buy a hanging basket or design your own and plant some simple flowering plants in it. Hang these flower baskets both indoors and outdoors. Stop filling your vases with scented flowers; hang a live flower basket instead. Though the initial cost of setting up a hanging basket might be pretty high, the total expenditure taking care of them will be considerably less when compared to normal flowering beds in your garden. They are way more convenient to handle, and can also make a great gift to any plant lover. The next time around, don’t worry about surprising the phytophilous friend of yours; simply present him a hanging basket with exquisite flowers. Whether you’re growing some usual houseplants or any of your favorite perennials, the option of plants available for your hanging garden are endless. You can easily choose the right plant for your basket depending on your specific needs, climate, soil, and other growing conditions. 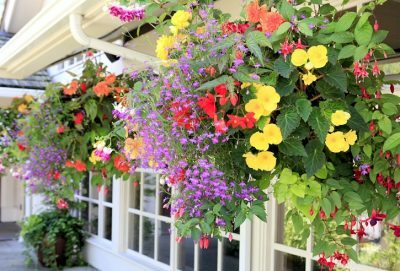 Trailing plants might seem to be a better option for hanging baskets, but with proper care you can make any plant work that way. When they are given the required proper growing conditions, any type of plant can be grown in the basket. However, some plants grow in baskets better than others. 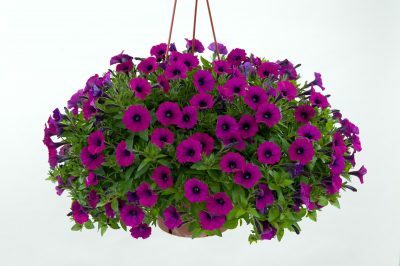 You can choose from the popular list of plants that go well with hanging baskets. These sun-loving plants have colorful blossoms and are the perfect choice for bringing on a pop of bold color to any dull area. These flowers bloom in a rainbow of colors and grow vigorously over a short time. They give out a splendid scent and flower from spring until the frost of the first fall. They can fit extremely well in your hanging gardens and attract butterflies and hummingbirds to your yard. Are you living in a hot and dry region? Don’t worry; Portulaca can be a great fit for your basket. Also called sun roses, they can grow well even in hot regions and require very less watering. They are easy to grow and come in various colors, like yellow, shades of rose, red, orange, purple, pink, and white. They usually bloom in the early summer and are capable of growing around your baskets. They can give you a visual treat all round the year. These are common bedding plants that can also be grown both indoors and outdoors in hanging baskets. 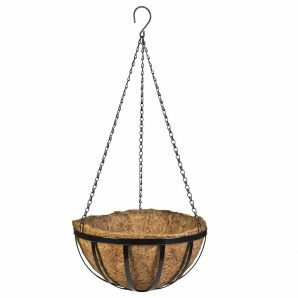 They can very well fit into any type of hanging basket, and all they require is deep watering and moderate amounts of sunlight. 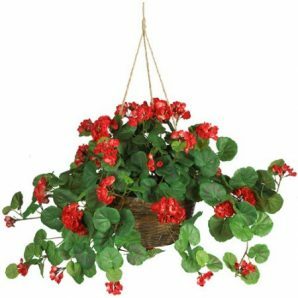 They come in shades of white and red, and are a perfect choice for your hanging baskets. Fuschia is an attractive, exotic flower that comes with striking two-tone colors of pink and white. These flowers are really delicate and can look great just about anywhere in your garden. However, they grow extremely well in hanging baskets and can make a good addition to your patios. They require moderate sunlight and regular pruning. You need to specially care for them as they are prone to bugs and infections, so make sure they get enough pesticides. They make great indoor hanging plants. Some varieties of begonia are grown for their striking flowers, while others are grown for their colorful foliage. They require bright, indirect sunlight and a lot of moisture. 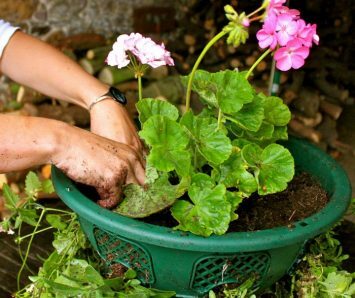 While growing begonia you need to make sure the soil in the basket is always moist but not too wet. These annual bloomers have a waxy orange and pink blossom, and can add an interesting aspect to your garden. Don’t limit your options to these plants alone. There are also many other flowering plants like verbena, moss rose, lantana, signet marigold, heliotrope, water hyssop, and many more. 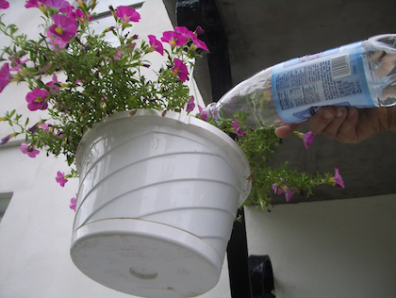 You can also cultivate some easy growing vegetables in hanging baskets. If you are in a humid region, you can easily cultivate strawberries, tomatoes, radishes, carrots, and similar other veggies. Herbs like basil, parsley, oregano, and such others can also be cultivated in hanging baskets. In addition to being useful, they also make good hanging plants. When it comes to hanging these plants around your house you need to take utmost care so they get enough attention from you. Often people hang these plants behind or around their houses, and fail to notice them or water them. It’s very important that you don’t end up doing the same. Before buying a hanging basket you need to make sure of a few things. You need to determine where you’re going to hang your flowering basket. 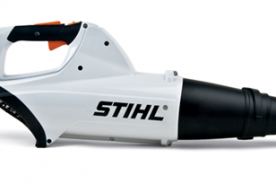 It can be indoor or outdoor, on your porch, corridor, courtyard, or even your bedroom. Make sure that you do the necessary arrangements, like fitting holders and hooks, in your desired location for hanging the plants. Always remember that all hanging plants aren’t made for your in-house garden. Some prefer excess sunlight, while others need moderate or no sunlight at all. While you hang a plant outdoors it will dry out fast, so you need to water them often to retain moisture in their roots. Some plants might need regular watering while others don’t. You need to keep those plants that require more watering outdoors, because the excess water might drain and soil your indoor environment. You can also leave your basket of plants hanging at from your rooftops, lintels, or arches. Once you have decided on the locations where you would place some hanging flower baskets, you can make your choice of plants accordingly. In case of indoor plantings choose plants that require less watering and don’t require much sunlight. While you go out shopping you can find typical plastic hanging baskets. If you can afford one, you can buy it for your planting setup. You can also go for cheaper wire baskets made of coconut shreds and bamboos. If you choose baskets made out of coco fibers, sphagnum moss, and similar others they tend to dry out quicker than plastic baskets. Choose a basket depending on the plant of your choice, and where you plan to hang it. Once you have acquired the basket, start making holes in it for planting around it. You can also drill drainage holes at the bottom and planting holes on the sides of your basket. This depends on the size of your basket and don’t poke any holes in your basket if you are keeping it indoors. You can choose ceramic or fully covered plastic baskets for your indoor environments. Once you have your basket ready, fill it with some lightweight potting mix. Buy a packaged mix that’s readily available or make your own mix. This can be easily made by mixing equal amount of peat moss, perlite, vermiculite, and some red soil. Some prepackaged mixes come with slow-release fertilizer, that can save your money on fertilizers and also boost your plant growth. In fiber baskets, you can mix water absorbing crystals so the basket doesn’t dry up soon. While filling the soil, remember to place water absorbent or fertilizer along with it for added feature. You can start planting the seeds or plants while adding soil to the basket. If you have carved any cuts on your basket, you can place a plant near them. Plan to pack your basket with single flowering plants or flowers of different kids as well. A combination might give a good visual impact to your basket. While planting them make sure that you place the taller and bigger plants in the middle and trailing plants along the edges. You can try varying blooming sizes and colors. This will give a good visual treat once they start blossoming. Water them frequently or whenever needed. You need to water them often in hot weather and limit watering during humid weather. You can easily judge if your plant needs water by lifting the basket. If your basket is lighter, then it obviously needs some water. Also make sure to mix the top of the soil once in a while. If you see over-growths of irregular pattern, you can very well start pruning them. Once you are all set with the planting and hanging procedures, all you need to do is to water the basket and wait patiently for the plants to start flowering. Plants in a container will need more water than the ones in the ground. Some plants might need more water while others don’t. Start watering them as per their requirement, and make sure that you don’t end up decaying the roots. When the blooms start fading and dying, you can pinch off the flower from the stem – this will promote more flowering. You can also remove a plant from a basket when it has stopped blooming. If they are in bunches, be careful while you remove a particular plant. You can simply cut off the stem and remove the root once it dries off. Make sure that you fertilize your basket once in a while. You can give your plants liquid fertilizers or any slow-release fertilizers; add them when the soil is still moist or after watering them. You can also start pruning them and cut off any drying florets to give space for new stem to grow over them. If you notice any overgrowth you can very well cut them down. You can get these flowering plants from the nearest plant nursery. You can also borrow seeds or pruned stems from your neighbors and friends; plant them on your basket. While getting a plant for your basket, make sure that they aren’t dry or withering. Also consider the price as you can get the same costly plant for free through stem cutting or seeding from someone who already has it. Also buy live plants and take care of them, don’t go for plastic flowers as they are not as good as live ones. All you need is great interest and patience to start hanging flowering baskets. If you’re naïve in hanging plants, don’t worry. All it needs is a good start to get used to it. Just buy some attractive florets and start taking care of them. You will eventually love it and start adding more of it in and around your house. Make your own in-house or outdoor hanging garden and give your home a pleasant ambience. When is the best time to plant hanging flower baskets? You can plant hanging flowering baskets all-round the year depending on the plant of your choice. 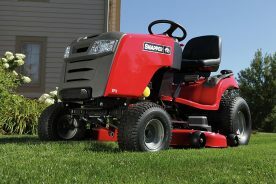 Generally, the start of spring is preferred for planting some greens because they can grow rapidly during this season. How do I keep birds out of hanging flower baskets? Birds and butterflies will definitely be attracted to your flowers. One good way to keep them away is building a small cage around your hanging blossoms. You can also start leaving out grains and water for birds to distract them from your flowering plants. Are there hanging flower baskets that attract hummingbirds? Some hanging flowers contain a lot of nectar and attract humming birds to it. Flowering plants like columbine, penstemon, coral bells, and more are capable of attracting hummingbirds to it. Some herbs and vines also attract humming birds. Plant these flowering plants on your hanging basket to give these birds a treat. How often should hanging flower baskets be watered? If you’re using a fiber basket, it will easily lose its moisture and will require frequent watering. In case of plastic baskets the water will not seep out through the bottom, and watering should be limited. Watering is also dependent on the plant you have on your hanging basket. Some perennials require frequent watering, while others can be watered very less. Indoor plants wouldn’t dry out as soon and will require less watering compared to the ones that are hung outdoors. What flowers should I plant in a hanging flower basket for full sun? If you’re planning to place your hanging basket in the sun, choose plants that require sunlight. Flowering plants, like verbena, geranium, heliotrope, ivy leaf geranium, signet marigold, licorice vine, and many others can be planted in the sun. You can also plant herbs, like mint, basil, oregano, thyme, chives, and more in the sun. Make sure that you frequently water the hanging baskets in the sun.